Recently I wanted to sort elements in a TableViewer via drag and drop and was astonished that I could not find existing helper classes or tutorial for this fairly trivial use case. So here is one for you in case you got the same use case. If you are just interested in the helper class, have a look at DnDSortingSupport. To have something to work on I will start with a TableViewer containing some data stored in a java.util.List. It is a default TableViewer and therefore I expect you have something similar ready for your experiments. Drag and Drop support for SWT is implemented via DragSource and DropTarget instances. To define that we can drag data, we need to bind a DragSource to a Control. In line 1 we create the DragSource and define allowed DnD operations. As we want to sort elements, we only allow DND.MOVE operations. Then we define the way data gets transferred from the DragSource to the DropTarget. As we stay within the same Eclipse application we may use a LocalSelectionTransfer. The first thing that happens on a drag is dragStart(). Technically the selection cannot be empty as we have to select something before we start the operation, so this implementation is merely to understand how we could deny the operation right from the start. After the drop operation got accepted in the DropTarget (see below) we get asked to dragSetData() and define what data we are moving. setSelectionSetTime() is not needed by our DropTarget, so again this is for completeness only. Finally we need to clean up after the operation is done. Implementation is similar like before, just now we need a DropTarget. Instead of writing our own DropTargetListener we may use a ViewerDropAdapter which covers most of the required work already. dragEnter() is the first thing that happens on the drop part of DnD. The default implementation is already fine. Our implementation additionally checks that the drag source is our current TableViewer. Further we disable the selectionFeedback. The feedback visually shows the user whether we drop before an element, on the element, or after it. The ViewerDropAdapter already supports these kind of feedbacks. Until bug 545733 gets fixed the helper class contains a small patch to provide before/after feedback only. It does not make sense to drop on another element when we do sorting, right? validateDrop() will be queried multiple times. We might check that we do not drop the table element on itself, but we spared this check for the current example. performDrop() finally implements the drop operation. To keep the helper class generic I used an interface that allows to insert elements before or after another element. An implementation of it needs to be passed to the helper class. The helper class comes with an implementation for java.util.List, which you may reuse. 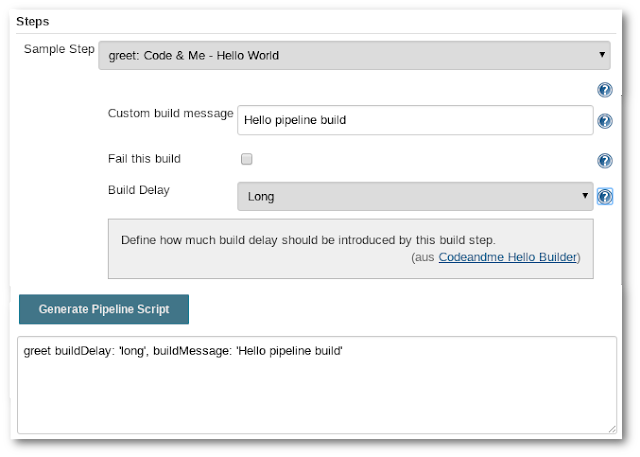 Next step in our Jenkins tutorials is to add support for pipeline builds. For a list of all jenkins related tutorials see Jenkins Tutorials Overview. Good news first: our code (including jelly) from the previous tutorial is ready to be used in pipeline without change. There are some considerations to be taken when writing pipeline plugins, but we already took care of this. When using the @Symbol annotation on the Descriptor we can provide a nicer name for our build step. Our current test target does not support pipeline jobs as we did not add the right dependencies to the pom file so far. We will first see how to add dependencies in general, in the next step we will fix the build afterwards. We always need groupId, artifactId and a version. To get these parameters you would typically look up a plugin on the Jenkins plugin site. Locate the link to the source code (Github) and open the pom.xml of the corresponding plugin. There you will find definitions for groupId and artifactId. Available versions can be found on the Jenkins Artifactory server (we added this server to our pom already). There navigate to the public folder, then follow the structure down, first opening folder from the groupId followed by the artifactId. For the pipeline dependency we would open public/org/jenkins-ci/plugins/workflow/workflow-aggregator. Latest version at the time of writing is 2.6. Setting the scope to test means that we do not have a build dependency on the plugin. Instead we need it only deployed and enabled on our test instance. like we did in the first tutorial. It will update the .classpath file in your eclipse project, automatically adding required libraries to the build path. Take care that also the .project file gets rewritten! We added our dependency, so everything should be done, right? This is one of multiple dependency conflicts detected. It seems that maven at first resolves the dependency with the lowest version number. As some plugins need a newer version, we need to resolve the dependency by our own. The simplest way I found is to check for the highest version of the required plugin (in the upper case: script-security) and add it to our dependencies sections in the pom.xml file. I was hoping for some maven help on this process, but failed. So I ended up adding required dependencies manually until the build was satisfied. You might run into other build problems, eg after adding a test dependency to the symbol-annotation plugin, my build started to fail, not being able to resolve Symbol.class anymore. Reason is that symbol-annotation is actually a build dependency rather than a test dependency. By binding it to the test scope only we broke the build. Once you sorted out all dependencies (see resulting pom.xml) your test instance will be able to run pipeline jobs. Coding the command line for our build step can either be done manually or by using the Pipeline Syntax helper. The link is available right below the Script section in your job configuration. Jenkins makes use of our previous jelly definitions to display a visual helper for the Hello Build step. We may set all optional parameters on the UI and let Jenkins create the command line to be used in the pipeline script. Our build is advancing. Today we want to move optional fields into an advanced section and provide reasonable defaults for these entries. To simplify the job setup we now move all parameters except the build message to an advanced section. Whenever a parameter is not required, remove it from the constructor and use a setter for it. Combo boxes are the next UI element we will add to our builder. The definition does not contain entries to select. These will be populated by the Descriptor class. ListBoxModel is basically an ArrayList of Option instances. The first string represents the text visible to the user, the second one the value that will actually be stored in our variable (see next step). Now that our builder plugin is working we should start writing some unit tests for it. Jenkins tests can be written as JUnit tests. The test instance needed for execution tests can be created using a JUnit Rule. In line 4 we create a test instance for our unit test. This instance is used from line 10 onwards to create and run our test job. The instance provides a set of assertion commands which we use to check the build result and the log output of the job execution. Our builder UI is progressing: today we will add a text box with nice defaults and add input validation to it. All done, give it a try! The method name needs to stick to the pattern doCheck<Parameter>. Normally you would only provide the parameter in question to that method (again the parameter name needs to match your field ID) but if needed you could add parameters for other fields of the builder. This comes in handy when parameters depend on each other. In the previous tutorial we did the basic setup for jenkins plugin development. Now we will try to create a plugin that actually runs a build step. then select the hello-world-plugin. But as we want to do it the hard way, we will add every single bit on our own and continue with the empty project from our previous tutorial. Jenkins expects the constructor to be augmented with the @DataBoundConstructor annotation. Later we will add our build parameters to it. The perform() method is the heart of our implementation. This is where we define what the build step should actually do. In this tutorial we focus on the definition, not the execution so we are just printing some log message to detect that our build step got triggered. Now lets put our focus on the Descriptor class. It actually describes what our plugin looks like, what parameter it uses and whether the user input is valid or not. You need to use a static class as a descriptor and augment it with the @Extension annotation to allow jenkins to detect it automatically. isApplicable() might be the most important one as it denotes if ou plugin is usable for the current project type. Create a new Freestyle Project and add your custom build step to it. Then execute the job and browse the log for our log message. When writing a plugin it is vital to understand which parts of the plugin do get executed on the master and which ones on a slave machine. The java code we just wrote does get executed on the master only. Even when a job is executed on a slave machine, the perform() method still gets executed on master. Therefore we cannot use classic java libraries like NIO or the ProcessBuilder to access and execute stuff on the slave. Instead we need to use abstractions like the workspace and the launcher parameters we get from Jenkins. These objects will take care to delegate IO calls or program executions to the slave. Make sure you always keep focus which parts of your code get executed where. Inside the jelly definition we can use plain HTML code. Run your test instance again to see your changes in your project configuration view. Time to add some input. All build parameters need at least 2 steps of implementation: first we need to define the UI in the config.jelly file, then we need to define the parameters in the java class. Optionally we may add additional checks in the Descriptor class. The new parameter needs to be added to our constructor. Make sure you use the same name as in the jelly file. Additionally we need a getter for our parameter. It will be queried to populate the UI when you configure your job and when the job gets executed. Jenkins expects the name of the getter to match the field name of your jelly file. During the build we evaluate our parameter and throw an AbortException in case our builder is expected to fail. Lots of parameters in Jenkins plugins show a help button on the righthand side of the form. These buttons automatically appear when corresponding help files exist in the right location. A general help file for the builder named help.html needs to be placed next to the config.jelly file. You may add any arbitrary HTML content there, with no need to use <html> or <body> tags. To provide help for our checkbox we create another help file named help-failBuild.html. See the pattern? We again use the field ID and Jenkins figures out the rest. Instead of a plain HTML files we could also provide jelly files following the same name pattern. Changes like adding help or beautifying jelly files can be done without restarting our test instance. Simply change the file and reload the page in your webbrowser of your test instance. Good documentation on writing forms seems to be rare on the internet. To me the best choice seems to find an existing plugin and browse the source code for reference. At least a list of all control types is available online.